Cristiano Ronaldo is among the nominees for the UEFA Goal of the Season prize. 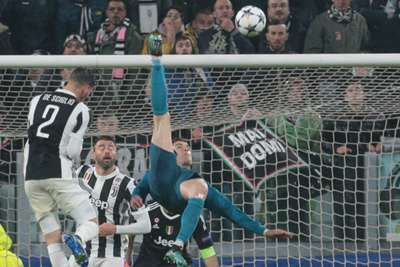 The Portugal superstar is one of 11 candidates in the running for the award following his stunning overhead kick for Real Madrid against his new club Juventus in last season's Champions League. Only one goal from each UEFA competition is nominated, so Ronaldo has been selected ahead former team-mate Gareth Bale, who scored a similarly acrobatic effort in Madrid's Champions League final defeat of Liverpool. Dimitri Payet provides the Europa League nomination, the France international producing a brilliant dribble and finish in Marseille's win against RB Leipzig. Ronaldo's compatriots Goncalo Ramos, Paulo Estrela and Ricardinho are also on the shortlist, along with Denmark playmaker Christian Eriksen. Supporters can watch all the goals and vote for their favourite on the UEFA website. The award was won by Mario Mandzukic last year, while Lionel Messi claimed the honour in both 2015 and 2016.